Itiel Dror and Stevan Harnad: the Web is the "Cognitive Commons"
Itiel Dror, who will be speaking at the 2008 Association for Learning Technology Conference (disclosure: I work for ALT half-time) on Wednesday 10 September in Leeds, sent me a chapter from a forthcoming book edited by him and Stevan Harnad - "Distributed Cognition" - which will be published - not sure when - by John Benjamins. The final sentence of the abstract (below for reference) struck a particular cord. You can also access the whole chapter in various formats including PDF and HTML from the University of Southampton's ePrints Server. "'Cognizing' (e.g. thinking, understanding, and knowing) is a mental state. Systems without mental states, such as cognitive technology, can sometimes contribute to human cognition, but that does not make them cognizers. Cognizers can offload some of their cognitive functions onto cognitive technology, thereby extending their performance capacity beyond the limits of their own brain power. Language itself is a form of cognitive technology that allows cognizers to offload some of their cognitive functions onto the brains of other cognizers. Language also extends cognizers' individual and joint performance powers, distributing the load through interactive and collaborative cognition. Reading, writing, print, telecommunications and computing further extend cognizers' capacities. And now the web, with its network of cognizers, digital databases and software agents, all accessible anytime, anywhere, has become our 'Cognitive Commons', in which distributed cognizers and cognitive technology can interoperate globally with a speed, scope and degree of interactivity inconceivable through local individual cognition alone. And as with language, the cognitive tool par excellence, such technological changes are not merely instrumental and quantitative: they can have profound effects on how we think and encode information, on how we communicate with one another, on our mental states, and on our very nature." Several Blackboard- and Desire2Learn related items come my way in the last few weeks, but holiday absence prevented me from using them. 27 August - about Blackboard's financial performance (with some discussion about the company's UK market share, based on a comparison between UCISA's 2005 and 2007 CIS surveys). Second, a slick and impressive promotional video from Blackboard about its "Next Generation" product - known as Blackboard NG - which has been described to me by someone on the inside of Blackboard as "light years ahead of Blackboard 8.0" (see also Nial Sclater's description of a talk about NG in Manchester earlier this year). I watched each of its eight "chapters". "The next click of that chart will move us to a place where fewer than 1/3 of our students are taking only on-ground classes. Forgive my bias in thinking that what we are seeing at UIS will spread among the rest of the 500 regional state universities. " elearning-reviews is an impressive, well-organised printing-friendly web site, from the Swiss Centre for Innovations in Learning. It "provides those interested in research on elearning with concise and thoughtful reviews of relevant publications". "This book also shows that the marginal importance (compared with e. g. prior learning experiences) of “general” learning styles (as it was shown in research) is still not recognised in the world of artificial intelligence and computer science; they still deal with the idea of several cognitive styles and the possibilities for adaptation of e-learning materials. By the way: We were surprised that the different ways of reasoning seemed not to be important to Vladan Devedižic. Some could say that we should not be so harsh with our comments on this book, because it is one of the first longer publications on this topic (published 2006). Yes, we agree – but we would not have been as harsh, if there were not some very interesting older publications, where we find a deeper understanding of what learning and education is and could mean in the Semantic Web. Nevertheless, we will use this book and can recommend it as a standard work about education and the Semantic Web with the clear strength in an overview about relating technical concepts." 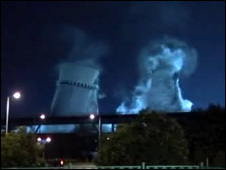 Sheffield's landmark 70 year old cooling towers were demolished at 02.00 GMT today. Links to video and BBC web site description of the towers falling. These two cooling towers above are on the edge of Sheffield, where I live, in South Yorkshire, England. They are next to the vast Meadowhall shopping centre, and the Tinsley Viaduct of the M1 motorway. Taking a leaf out of Soweto's book (see also the picture on the right), there is a campaign to turn them into massive works of public art to reflect what Sheffield is now: "green, creative and different". Funds are stacking up to make the project a reality. The Channel 4 TV company is committed to the idea. But there is a problem. Eon, owners of UK electricity company Powergen and the towers, wants to demolish them. Today my sister and brother in law issued a media release stemming from last month's Inquest into the death of their son Toby. Regular readers of Fortnightly Mailing may remember from a long post I wrote in October 2007 that my 25 year old nephew was killed 2 years ago on his way to work in Liverpool. His car was waiting in a morning rush hour queue on the M62 motorway approaching the Rocket Interchange. The queue was hit from behind by a heavy goods vehicle and Toby’s car was crushed. The driver of the HGV had fallen asleep at the wheel, and was later diagnosed to be suffering from Obstructive Sleep Apnoea (OSA). When we investigated OSA we found serious weaknesses in the way that the condition is controlled by Government, by the road haulage industry, and by General Practitioners. Following the Inquest, the Coroner issued a Rule 43 Report to the Lord Chancellor, calling for major changes in the way that sleep apnoea amongst lorry drivers is dealt with. The media release [137 kB PDF] provides full details, and includes the Rule 43 Report itself, as well as the bulk of a fascinating and comprehensive report to the Inquest by Dr Dev Banerjee, who is Consultant Respiratory and Sleep Physician at Birmingham Heartlands Hospital. better education of commercial drivers to make them aware that a diagnosis of OSA is almost certainly not the end of their livelihood as a driver. Under new rules that came into force on 17 July, the Lord Chancellor is required to respond to a Coroner’s Rule 43 Report within 56 days.